Will you choose the new iPad or, er, the old one? in a pathetic attempt to try and get some press coverage. Meanwhile back in our world, the new iPad launch was the usual hotly anticipated big deal. Pre-launch coverage was so over-the-top that we half expected to read articles telling us what we could expect from the articles telling us what we could expect from the expectations people were expecting from the speculation about the cold fusion-powered holographic iPad 8 that a man in the pub thought DigiTimes probably said Apple were making. As a result, Apple's actual announcement - the best iPad it's ever made and an update to the handy wee Apple TV - was greeted with online boos as well as oohs. Hype aside, is the new iPad any cop? You betcha. As Patrick Goss explains, it has "a superlative Retina Display, quad-core graphics A5X processor, better connectivity and an improved camera". That display has a resolution of 2048 x 1536, which is "enough to leave the most hardened of screen nuts smiling". It's "genuinely beautiful". So what else is new? There's an A5X processor, which has quad-core graphics (although it isn't, as some sites were claiming after the launch, a quad-core processor) and which Apple claims is twice as fast as Nvidia's Tegra 3. There are better cameras, one of which is good for 1080p video recording if you don't mind looking as if you're filming with a dinner plate, and support for every wireless standard you can possibly imagine including Bluetooth 4.0 and 4G mobile broadband. Faster processing, a better screen and faster wireless don't mean sacrificing battery life, though: Apple claims that you'll get the same 10-hour battery life (9 hours on 4G) as the iPad 2, although the slightly thicker, slightly heavier case suggests Apple may have had to cram more battery in there to achieve that. There's new software too. The iOS 5.1 update brings iCloud streaming for movies, while Apple has brought iPhoto to the iPad and updated its other iLife and iWork apps to take advantage of that fancy new display. The rumoured Siri integration didn't make it into the final release - at least, not entirely. The new iPad offers automatic dictation in English, French, Japanese and German. You'll be able to get your hands on one on the 16th, although Apple's taking pre-orders already, and the prices haven't gone up: the cheapest new iPad, the 16GB Wi-Fi model, starts at £399, rising to £559 for the 64GB model and £659 if you want 4G too. We'd hang fire on buying that one until we actually get some 4G networks in the UK. Apple did another interesting iPad thing: it kept the iPad 2, slashing its price by $100 in the US and dropping it from £399 to £329 for the 16GB model over here. As Kate Solomon points out, "That is a crazily low amount of money for an Apple tablet – in fact, it's pretty low for any tablet. 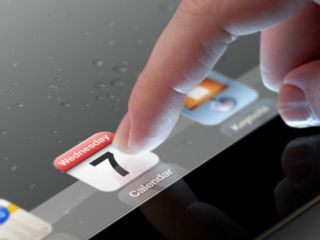 [It] could put paid to the rumours of a lower-cost iPad Mini to compete with the likes of the $199 Kindle Fire."